Fertile, well drained soil with compost dug in. In clay soil, grow in raised beds or rows. Not normally required, though overwintered sets can be given a liquid feed in spring. Beetroot, Cabbage, Carrot and Silver Beet. 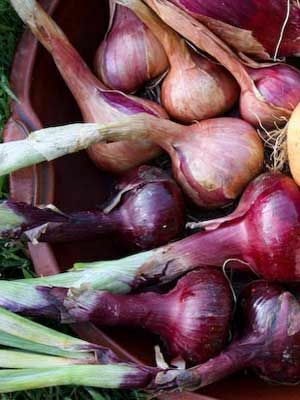 Onions can be grown from seed in which case start in pots under cover in late summer before planting out autumn to winter. Japanese variety onion sets can be used to give an early harvest. Harvest as soon as they reach a reasonable size. If storing them, wait until the tops start to die down and dry for about 10 days. Not recommended in the tropics. Weed early and often to keep onions growing strong. Seedlings are less likely to bolt (produce flowers) compared to bulb onions grown from sets.